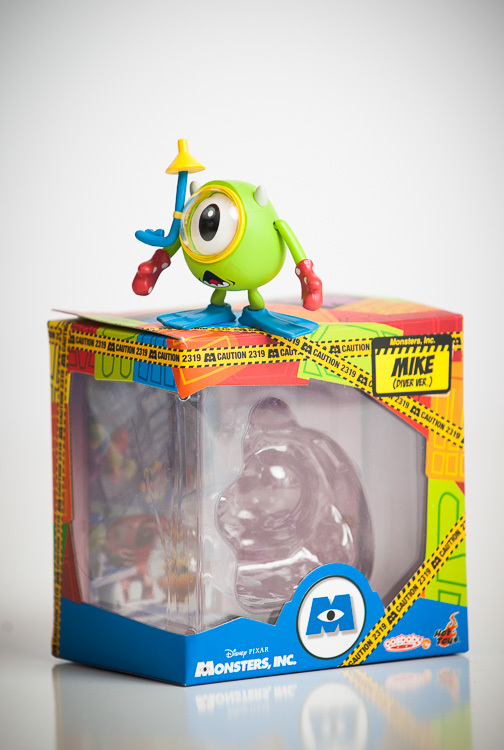 As if perfectly timed between the re-release of Monsters, Inc. 3D and the release of Monsters University, a nostalgic series of (very cute) Cosbaby Monsters, Inc. characters are now shipping. The toys are mini vinyl characters that are extremely detailed and, in most cases, are poseable. The Mike (Diver version) can move his arms, oven mitts (hands) and legs (although his flippers are stationary). Randall's head can swivel and the blue portion of his tail can also swivel, but his legs are not able to be moved. Boo (Monsters version) is not able to be posed, but the details of her costume (all the way to the clips in the back that hold the costume on tightly) are all in tact. 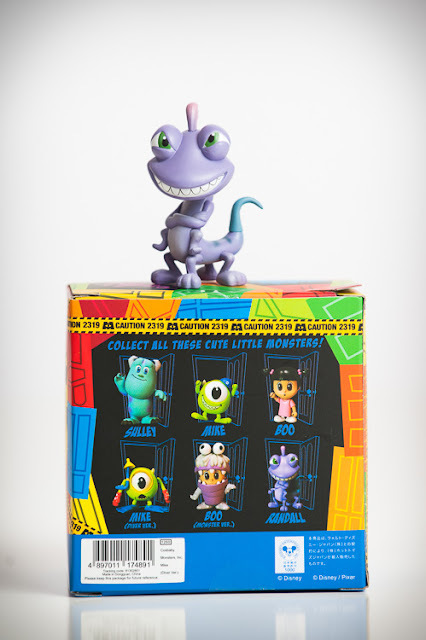 The full set of characters that are offered are Sulley, Randall, Boo, Boo (Monsters Version), Mike and Mike (Diver Version). Each character averages approximately three inches in height and is a similar weight to a typical Vinylmation character. You can purchase the Cosbaby Monsters, Inc. toys by viewing them on the Sideshow Collectibles website. Also, if you haven't seen them before, be sure to also look at the (no longer sold) Cosbaby Toy Story series.